*Imperial Measurements 29 x 33 1/2" *This pattern is written in U.S. Crochet terminology * This pattern is suitable for beginners. *This pattern includes a complete list of yarns and colors used. *photo instructions are included. This crochet Eyelet Baby Afghan is so sweet. The ombre effect of red to white, joined to the bright blue in the middle, make a stunning change of color. The crochet blanket pattern is rated as a beginner pattern, but even seasoned crocheters will enjoy making this afghan. The easy eyelets add interest without being overwhelming for the beginning crocheter, and the bright colors make it fun to crochet. Who says girls can't have bright red and blue blankets! I personally design, crochet and write every pattern listed in my Tulsa Oklahoma, Studio. 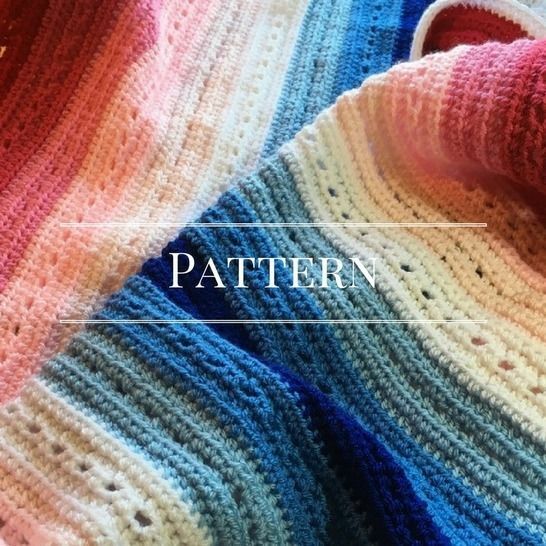 This baby blanket is crocheted with washable acrylic yarns. The finished size is 29" x 33 1/2" inches. The pattern is written in U.S. crochet terminology. You may crochet this pattern out of any baby weight yarn you choose. This pattern has photo instructions and includes a complete list of supplies.